Trooper Brian McMillen was killed when his patrol car was involved in an accident with two cars operated by intoxicated drivers on Dye Road, south of I-72 near Illiopolis. Trooper McMillen was en route to a tavern, just outside of Illiopolis, to assist two deputy sheriffs with a disturbance when his patrol car was involved in the collision. Both drivers were intoxicated and had just left the tavern Trooper McMillen was responding to. Both drivers were convicted of aggravated DUI. One was sentenced to 14 years and the other driver was sentenced to 10 years in prison. 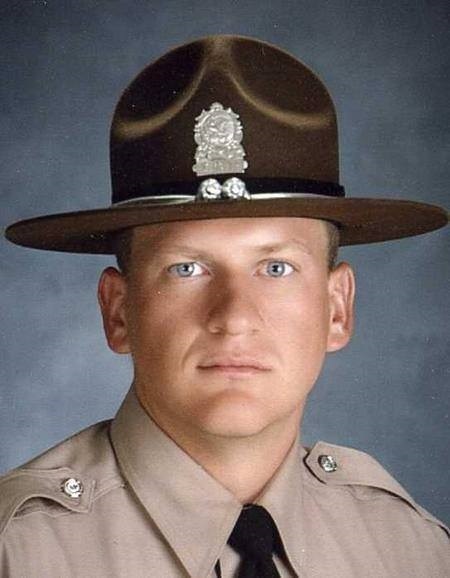 Trooper McMillen was an Illinois Air National Guard veteran and had served with the Illinois State Police for 8 months. He is survived by his wife. I just wanted to take a minute today and wish you a Happy 35th Birthday! The years have gone by so fast it seems. I know that not a day goes by that you're not thought of and missed so much by all the people whose lives you touched. So... Happy Birthday!